#ALGORITHMS: "How to Keep New Year's Resolutions"
New Year's resolutions often scatter on the winds of change during a typical year, with many of us failing to keep them after just a single week. By planning "bite-sized" but consistent progress toward resolutions, however, psychologists claim we can increase our chances of success. As many as 45 percent of Americans will make New Year's resolutions for 2012, but less than half will keep them, according to psychologists. To improve your chances of keeping your resolutions, researchers offer some words of advice: Start with a plan, make bite-sized progress and regularly renew your efforts. The most important element of success in New Year's resolutions is making a plan, according to Wake Forest University professor Emer "E.J." Masicampo. By creating a plan, you commit to accomplishing your goal in a specific manner that can be rehearsed in your head. Studies have shown that rehearsing actions activates the same neural pathways in the brain as actually performing those actions, giving you a head start on creating a new habit. Besides making a long-term goal easier to accomplish, planning ahead also reduces a kind of fatigue that often motivates people to abandon their resolutions. But by committing to a specific plan, you can stop fixating on the goal and let your mind consider other thoughts, thus eliminating "goal fatigue." 1. Specify exactly what you’re going to do (where and when). 2. Make sure the goal is under your control (not dependent on others). 3. Imagine specific opportunities to meet your goal (from your everyday life). 4. Choose a goal you are motivated to accomplish. Fellow psychologist at Wake Forest, William McCann, adds that people often give up on their New Year's resolutions because they seem overwhelming. But by picking resolutions that are feasible, we can be more assured of accomplishing them. McCann suggests rephrasing our resolutions to include specific achievable goals, such as eating a little less fried food this year, talking a little less and listening a little more, and smiling a little more this year. The Monday Campaign makes use of emails, Twitter, and Facebook to reaffirm resolutions every Monday. And by breaking down long-term goals like "eat healthier" into bite-sized accomplishments, you can bite-by-bite whittle away at long-term goals that seem too overwhelming to accomplish all at once. The Monday Campaigns sponsored a nationwide survey by FGI Research, which found that long-term resolutions are more likely to be accomplished with small, incremental changes. For instance, if your resolution is to eat healthier, then each Monday you could swap out a healthy alternative, such as having water instead of soft drinks with meals. Then on Week 2 swap out your morning donut for whole-grain toast. And by the end of the year you could have developed 52 healthier eating habits. 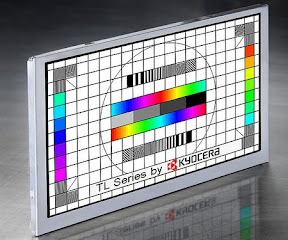 #DISPLAY: "Kyocera offers lifetime LCD supply"
A lifetime supply of liquid-crystal displays (LCDs) is being guaranteed to original equipment manufacturers (OEMs) by Kyocera Corp., which recently extended its acquisition of LCD and touchscreen suppliers by purchasing Optrex Corp.
Last year, Kyocera (Kyoto, Japan) acquired Sony's small- and medium-sized LCD fab, and last week it added Optrex (Tokyo) to its manufacturing base for OEM displays and touchscreens. Optrex specializes in ruggedized displays for industrial, automotive, medical, telecommunications and appliances. #MARKETING: "Diverse Workforce Fattens Bottom Line"
The melting pot concept enhances enterprises the same as nations, since diverse groups combine the talents of their strongest members and compensate for individuals' weaknesses. The combination is a stronger overall organization. Diversity in the workplace not only makes ethical sense and fulfills government mandates, but it actually fattens an enterprise's bottom line, according to a recent survey study performed by Canadian researchers. Led by Ryerson University (Toronto), the study found that diverse workforces are happier, more loyal and more productive. Unfortunately, the study also found that some organizations only pay lip service to diversity and thus do not realize its benefits. However, enterprises that proactively seek to instill diversity into all levels of their organizations are rewarded with enhanced profits when they successfully overcome old-school biases that derail diversity efforts at less diligent enterprises. 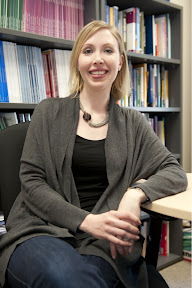 The most successful organizations are those that have gone beyond what professor Kristyn Scott at Ryerson University calls "window dressing," but rather "have woven diversity into every fiber of its corporate culture and business practices." Scott performed the work with fellow professor Ted Rogers, as well as University of Toronto professor Joanna Heathcote and University of Guelph professor Jamie Gruman. The researchers defined diversity not only as ethnicity, but also age, gender, educational background and professional experience. The group concluded that diversity fattens bottom lines. This conclusion was reached after surveying the results of 100 studies between 1991 and 2009 and measuring their reported results against the six key advantages of diversity. Those advantages include easier recruitment, greater creativity, better problem-solving, more flexibility (better reaction to change), lower cost (less employee turnover) and more successful marketing (stronger financial performance). Results varied regarding the degree to which each of the six advantages was realized in any one organization. Nevertheless, overall the results were overwhelming in that the more enterprises implemented diversity in their corporate culture, the happier, more loyal and more productive was its workforce, resulting in greater corporate prosperity. For diversity-embracing companies, "recruiting top talent becomes easier, group processes will be enhanced, which means employees are more likely to stay, which, in turn, increases the company's bottom line," said Scott. To reap the real benefits, enterprises must do more than just talk the talk on diversity; they must walk the walk by enforcing a corporatewide cultural paradigm shift. In other words, diversity needs to be consistently enforced at all levels—from clerk to CEO, according to the researchers. Campbell Soup Co. was cited by the Canadian researchers as a good example of an employer already proactive in diversity, with well-publicized efforts to level the playing field for women, homosexuals, Hispanics and Asians. The company also includes many training programs for managers on diversity awareness, inclusive leadership and how to maintain awareness of unconscious biases. #ALGORITHMS: "Six Ways to Kill Enterprise Innovation"
Why do some companies succeed and others fail? Hiring even the most creative people will not result in an innovative company unless the six constraints that cause failure are nixed in advance. Key to success in modern business is innovation, but other than hiring creative people, what determines whether an innovative company will be successful? Professor David Owens of the Vanderbilt University business school thinks he has the answer. You must simultaneously satisfy six constraints to succeed. Owens’ six constraints span everything from basic technological advancements to the internal dynamics of the corporate culture. “The constraints are the parameters within which one must work--and for creative people, that’s actually a blessing,” said Owens. Constraint 1: Technological Feasibility--innovations must be technologically feasible, advancing our understanding and control of matter and energy while avoiding excessive research and development efforts. Constraint 2: Societal Feasibility--innovations must be in-tune with trends in public awareness, offering fashionable additions, like social networking, while avoiding practices that are morally or ethically repugnant, like cloning. Constraint 3: Industry Feasibility--innovation is more than just creativity; users must perceive the utility and value of creative additions to your company's products and services, as opposed to your competitors, in order for them to be counted as innovative. 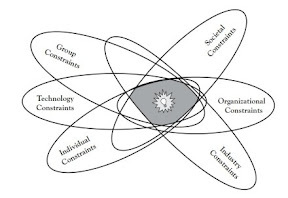 Constraint 4: Organizational Feasibility--innovations require a corporate culture that encourages the free movement of new ideas plus the human, monetary and other resources necessary to nurture them. Constraint 5: Group Feasibility--innovations require a social climate of hope and optimism in order to encourage the expression of creativity. Constraint 6: Individual Feasibility--innovations require people to "think differently," which can be achieved with proper training in the tools and processes that foster creativity. Although most advice on fostering innovation focuses on new products, Owens claims in his book “Creative People Must Be Stopped: 6 Ways We Kill Innovation (Without Even Trying),” that his six constraints must be satisfied by any organization seeking success. "We often think of innovation as product innovation, but we don’t often think of it as creating new processes or new services or even as changing our ways of thinking about things," said Owens. "What we need is the kind of vision correction that will enable us to see in advance the vital factors that determine our chances for success." 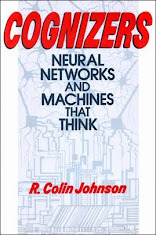 Owens’ book advises that by analyzing all potential new innovations with his six constraints, enterprises can advance to proactive strategic development, instead of retrospective analysis of successes and failures, resulting in innovative new products and services with improved chances of success. #ALGORITHMS: "Freemiums Spreading to All Apps"
The business model by which software and services are offered free-of-charge for basic features, but require a payment for advanced features, is predicted to become the norm in 2012. The use of freemiums--in which applications are free for basic use, but payments are required for advanced features--will intensify in 2012, making it entirely possible that by this time next year all relevant iOS applications will be free in most categories. In 2011, the number of freemium applications in the top 250 at the Apple App Store topped 88 percent, according to Allied Business Intelligence (ABI Research). The freemium business model uses in-application advertising and purchases for income, a trend that ABI Research predicts will extend to 100 percent of the top iOS applications by the end of 2012. "Freemium isn't just about monetizing anymore, it’s also about marketing," said ABI Research senior analyst Aapo Markkanen. "The threshold for consumers to download free apps is really low, so more people end up using and recommending them, which gives those apps a bump in distributors’ rankings that paid apps fail to draw." Apple's App Store has a head start over Google's Android Market, since iOS started offering in-app purchases in 2009. 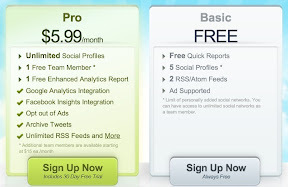 Google's Android Market, on the other hand, is slated to convert to the freemium in-application purchase model in 2012. To be sure, some categories of iOS application will continue to be paid, such as navigation applications because they require complex online databases for the street indices. Today, more than 25 percent of the top iOS navigation applications are still on the paid model. However, in some categories, such as lifestyle, entertainment and games, the freemium model has almost completely taken over the iOS application space, with only with 3, 5 and 6 percent of those applications still being paid, respectively. Freemium cloud services are also spurring the whole mobile enterprise social-collaboration market, which ABI Research predicts will top $1 billion in 2011 and grow to $3.5 billion by 2016. Today, the number of social interactions over mobile devices is increasing exponentially, according to ABI Research, prompting cloud-based platforms to leverage their multi-modal capabilities of delivering the same content to different devices. The popularity of these multi-modal social-media applications is fueling the expectation that cloud-based services should also offer user communication and collaboration tools. Likewise, expectation for freemium, rather than paid-based services, is also rising, allowing cloud-based services to offer their social-media tools for free to boost their ratings, and in-turn, paid subscriptions. #ALGORITHMS: "Smarter Technologies Help Santa Complete His Yearly Rounds"
A unified-field physicist visits Santa's workshop to unveil the smarter technologies that make the holidays magic. Santa's magic might seem far-fetched to jaded grown-ups, but in the spirit of Arthur C. Clarke's famous maxim that "any sufficiently advanced technology is indistinguishable from magic," scientists have cataloged Santa's smart technologies during a past visiting scholar program to his North Pole workshop. Santa's "magic," it turns out, is a result of his access to advanced smart technologies, according to Larry Silverberg, a professor of mechanical and aerospace engineering at North Carolina State University. Silverberg visited the North Pole with his helpers, who identified these technologies. Mohammad Zikry looked into the novel materials used by Santa, Greg Buckner explored robotics, Fred DeJarnette investigated space travel and Herb Eckerlin examined energy conservation. Smart technologies help Santa conduct business. "Based on what we learned at the North Pole about Santa’s delivery methods," said Silverberg, "it would be impossible for him to accomplish his annual mission without smart technologies." Smart technologies are nothing new to Santa, who has had access to advances in transportation, manufacturing and delivery for over 200 years. Today, Santa is able to deliver packages to all good boys and girls using a variety of smart technologies combining electromagnetic waves, the space/time continuum, nanotechnology, genetic engineering and computer science. Santa's main stumbling block, according to grown-ups who have lost their faith in him, is that the current world population has just topped 7 billion, making it impossible to deliver all those presents in a single night. However, according to presentations by 11 engineers during Silverberg's visiting scholar trip to the North Pole, Santa makes smart use of "relativity clouds" to allow him to stretch time "like a rubber band." "Relativity clouds are controllable domains--rips in time--that allow Santa months to deliver presents while only a few minutes pass on Earth. The presents are truly delivered in a wink of an eye," said Silverberg. 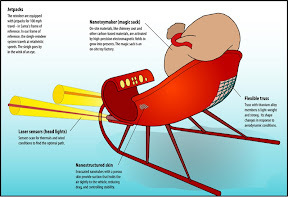 Santa also does not have to manufacture all the presents ahead of time either, but only needs his elves to maintain a database of who-wants-what, leaving the manufacturing of gifts to nano-machines in his bag where snow and soot from roofs are transformed into toys using molecule-by-molecule bottom-up construction. After the gifts for one residence are delivered, Santa's nano-machines refill his bag with just-in-time manufactured gifts for his next stop. But how does Santa know what toys each child wants? The elves database of children and the toys they want is constructed from snail mail and emailed lists, as usual, but is also supplemented by a listening antenna that uses wireless electrocardiography to tell the difference between Mary in California wanting a "surfboard" and Michael in Minneapolis wanting a "snowboard." #ALGORITHMS: "Giving Big Beats Giving More"
People mulling over stocking-stuffer gifts for the holiday season and businesses offering giveaways should study the findings of new research that looks into recipient perceptions about add-on gifts. Researchers claim that giving one big gift is perceived as more generous by the recipient than combining a big gift with smaller stocking stuffers. Adding the smaller gifts decreases the perceived value of the one-big-gift. Researchers at the Pamplin College of Business (Virginia Tech) have analyzed the phenomenon and concluded that bundling together a big gift and a smaller stocking stuffer indeed does reduce the perceived value of the overall package for the recipient. "Suppose you’re trying to impress a loved one with a generous gift this holiday season," said Kimberlee Weaver, assistant professor of marketing in the Pamplin College of Business. "The recipient is likely to perceive an expensive luxurious cashmere sweater alone as more generous than the combination of the same sweater and a gift card." Most shoppers would think that adding monetary value with a gift card is better, but the result is that the value given to the gift card--say $10--is actually subtracted from the value of the big gift in the mind of the recipient. "The gift-giver, or what we call the presenter, has just cheapened the gift package by spending an extra $10 on it," said Weaver. Weaver's research team calls this phenomenon the "Presenter's Paradox" because gift-givers and gift-receivers have different ways of measuring value. Gift-givers follow a "more-is-better" paradigm, whereas gift-recipients measure the value of the big gift against the value of the stocking stuffer. "An expensive luxurious sweater represents a generous ‘big’ gift, but adding on a ‘little’ gift makes the total package seem [to have less value]," said Weaver. Weaver's collaborators, Stephen Garcia and Norbert Schwarz of the University of Michigan, also note that this phenomenon pervades all presentations, whether it is a gift or a public lecture. The one "big" item needs to be presented by itself, not together with lesser items. 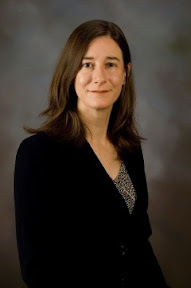 For example, when it comes to a lecture, "the addition of mildly favorable information dilutes the impact of highly favorable information in the eyes of evaluators," said Garcia. "Presenters of information would be better off if they limited their presentation to their most favorable points. Just as gift-givers would be better off to limit their present to their most favorite gift." The researchers found the phenomenon to be pervasive in seven studies across domains, including product selection, bundles of music albums, hotel advertisements, scholarships and even "negative items," such as penalties. For instance, when a judge adds on community service to a fine, they actually decrease the severity of the fine in the eyes of the plaintiff. "Adding a couple of hours of community service makes the overall penalty appear less harsh and undermines the deterrence value of a big fine," said Weaver. The lessons from these findings can be applied to many business situations. Whether the question is which reviews to include on a book jacket, which songs to include on a music album, which arguments a legal team should use in court, which features to pitch when selling a house, or which skill to pitch when a person interviews for a new job, the best approach is to stick to a short list of top items. In other words, for presenters, more is not better. 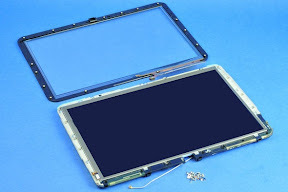 #DISPLAYS: "Touchscreens adopt on-cover over in-cell"
LCD vendors worldwide are being pressured by smartphone and tablet makers to quickly integrate touch into the display itself, using in- or on-cell sensors, but slow development has prompted add-on touchscreen vendors to offer interim sensor-on-cover, touch-on-lens, and similar one-glass solutions, at least for 2012. 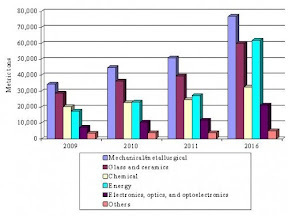 In 2011, over 566 million projected capacitive touchscreens were shipped for smartphones alone, according to NPD DisplaySearch (Santa Clara, Calif.), and for 2012 that number is likely to mushroom as tablets, laptops, and all-in-one PC makers adopt add-on touchscreens in lieu of integrated touch with in- and on-cell LCDs. #SPACE: "Advanced-Civilization Planetary Systems Discovered"
Stars that have evolved for billions of years longer than our sun have recently been found to have 18 gas-giant planets, potentially hosting advanced civilizations on any Earth-like planets there. The 18 new planets recently discovered by ground telescopes were upstaged by NASA's space telescope, Kepler, which also recently announced a new cache of planetary discoveries, including the most promising Earth-like planet yet. 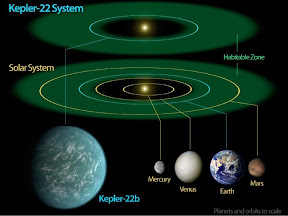 NASA's newest habitable-zone planet, dubbed Kepler-22b, is much more likely to host an advanced civilization than its previous candidates, which have orbits on the fringe of habitability, like Venus and Mars. Although NASA's newly discovered planet is twice as big as the Earth, Kepler-22b has a star in the same G-class as our sun; plus, its orbit is 290 days, very similar to the Earth's 365-day year. So far NASA's space telescope has discovered 2,326 new planets--207 approximately Earth-sized--but only a handful of these are in the same habitable zone around their stars as the Earth, Mars and Venus. As G-class stars age, however, they expand into Red Giants (A-class), which engulf their closer planets--like Mercury--and incinerate the rest with radiation, a stage that will occur after billions of years of further evolution by our sun. The spate of new planets recently discovered by ground telescopes, however, concentrated on "retired" stars that have already evolved to the cusp of changing into Red Giants. Consequently, any Earth-like planets accompanying these 18 new gas giants have been evolving for billions of years longer than on Earth, potentially hosting civilizations more advanced than our own. The California Institute of Technology (Caltech) scientists leading the survey team, however, were not looking for advanced civilizations, but were merely trying to maximize their successes with the methods amenable to discovering planets by ground-based telescopes. The 18 new planets were confirmed using the Keck Observatory in Hawaii with follow-ups at the McDonald Observatory (Mt. Davis, Texas) and the Fairborn Observatory (Paradise Valley, Ariz.). The teams surveyed more than 300 retired stars (A-type), most of which had just begun their evolution to Red Giants with diameters about 50 percent larger than our sun. Eventually, these stars will grow to be a hundred times larger than the sun, engulfing nearby planets and burning off the atmospheres and oceans of any Earth-like planets that do not get engulfed. Of course, any advanced civilizations there will be looking to relocate to nearby star systems with habitable planets like Earth. The scientists’ motivation, however, was to study retired stars because any planet-induced wobble from gas giants can be detected with ground-based telescopes. In more detail, the star's spectra exhibits Doppler shifts of signals coming from them, which can only be caused by planets with masses about the size of Jupiter. The teams confirmed 18 gas-giant planets are circling these retired stars. Any smaller Earth-like planets that might circle these stars, unfortunately, cannot be detected by the Doppler method, leaving it up to NASA's Kepler to potentially detect them in the future. Now, the scientists are cataloging the characteristics of the 18 new gas giants--which is half as many as have been previously detected in the complete history of astronomy before Kepler--to determine if they can reveal any new facts about planetary evolution. So far, they seem to indicate that the oblong elliptical orbits typical of some gas giants will evolve to be closer to symmetrical circles as observed in the 18 new ones. #MATERIALS: "Rare earth demand, supply rising for next five years"
Despite China's virtual corner on the market of rare earths, demand is skyrocketing along with investments in new mines worldwide that has some pundits talking of a "rare earth bubble." The U.S., Canada, Australia, Kazakhstan, Mongolia, and even Afghanistan all have strategic efforts underway to reopen rare earth mines, many of which will be producing ore within five years. #ALGORITHMS: "Mobile Device Design Gets Smarter"
Smarter mobile devices could soon be defined with rules rather than instructions, by virtue of a new paradigm for developing hardware and software. Next spring, a smarter paradigm for designing mobile devices will debut at the Association for Computing Machinery’s 17th International Conference on Architectural Support for Programming Languages and Operating Systems. There, researchers at the Massachusetts Institute of Technology's (MIT's) Computer Science and Artificial Intelligence Laboratory (CSAIL) will unveil a language that describes a mobile device's functions as sets of rules instead of as instructions. This will allow the functions to be optimally partitioned into hardware and software on an ad hoc basis. 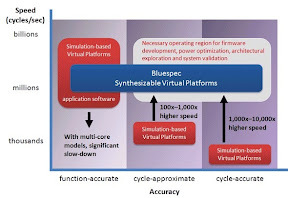 BlueSpec’s Synthesizable Virtual Platform (SVP) allows software for a new system-on-chip to be developed and tested before the hardware is actually built. Smarter designs can result from thinking about computations as sets of rules that describe a function, rather than as instructions defining modules of hardware and software, according to the MIT researchers. By creating a language in which the functions of a new mobile device can be described, and then adjusting which will be performed by hardware and which by software, the system can be optimized for performance, battery savings, or low cost--depending on the budget and market to be addressed and all without building a single physical prototype. Today, designers of a new mobile device must trust the expertise of engineers in deciding which functions need to be performed in hardware and which in software. In this approach, there are few opportunities to change that partition during the development process even if the prototype shows that too much reliance on software is slowing the device down or too much reliance on hardware is running down the battery. Often any repartitioning has to wait until the next generation device, since changes in prototypes are often too costly and time-consuming to justify. MIT claims that by switching to its description language, all the functions to be performed by the device can be defined ahead of time, allowing the engineers to experiment with different partitions into hardware and software. This allows them to use analytics to compare performance, energy consumption and cost before deciding on an optimized system to implement as a prototype. Arvind previously invented a language for defining hardware functions, called BlueSpec, for which he founded a commercial company in 2003 called BlueSpec. The new software system is an extension of BlueSpec, but created by Arvind, Kind and Dave at MIT to describe functions without committing to whether they are hardware or software. Once specified by the designer, the extended BlueSpec compiler outputs code for each--Verilog-code that specifies the hardware chips along with C-code that specifies the software algorithms. The extended BlueSpec compiler also alerts designers to any functions that cannot be performed within the stated constraints, and marries general-purpose processors with any application-specific integrated circuits (ASICs) needed to realize a design. #MATERIALS: "Flexible substrates harness carbon"
Switching to a new formulation of cabon nanotube ink can enable the fabrication of smart devices that are flexible, fast, cheap and extremely durable, according to new results at the U.S. Department of Energy's Lawrence Berkeley National Laboratory. Berkeley Lab said the new material could be used for displays as well as for sensors that monitor cracks in bridges, buildings and planes, for medical bandages that actively treat infections, for disposable food packaging that detects spoilage, and to turn textiles into solar panels. #ENERGY: "Smart Grids Driving $1 Billion Markets"
As the global energy grids modernize with smart meters, alternative generation and energy storage technologies, whole industries will get infusions of prosperity. Energy grids are modernizing at an accelerated pace, with smart infrastructure projects getting underway worldwide. In addition to the grid itself, whole industries hope to grow in prosperity as the smart upgrades consume their resources. The smart grids will span installations from the giant electrical generating stations all the way down to smart home appliances. Ubiquitous communications and control will allow cloud computing resources to communication with energy efficient buildings, home energy management systems, and individual smart appliances anywhere on the Internet. By automatically balancing loads on the grid, shifting non-mission critical functions (like drying clothes) to off-peak hours, and by using local storage arrays to buffer peak-demand periods, future smart grids aim to both efficiently and reliably service urban and rural electricity users alike. Smart grids will also be a necessity in order to accommodate the coming legions of all-electric vehicles that will be charging from the grid by the end of the decade, according to IC Insights. Grid modernization will also incorporate renewable energy sources and sinks--from photovoltaic solar panels and wind turbines to neighborhood fuel cells and liquid-battery storage arrays. IC Insights estimates include the entire smart-grid infrastructure, electrical storage systems, smart meters and IT investments needed to run it all. Since the infrastructure will be smarter, it will require IT investments for the computers and networks controlling and coordinating the scheduling and balancing of loads on the grid. In addition, an increasingly diverse array of alternative generation and storage technologies are being accommodated, creating whole new industries. Total smart grid expenditures today are under $100 billion annually, according to a new Research Bulletin from IC Insights Inc. Accelerated growth over the next four years will boost annual funding of smart grid infrastructure to nearly $200 billion. The semiconductor industry that enables smart meters to be smart will likewise almost double along with the smart grid itself. 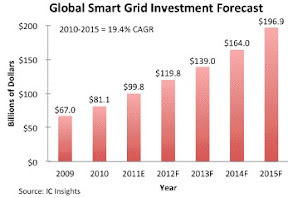 This market (including all semiconductor microchips used in smart grid projects) will grow from $524 million in 2010 to $1.1 billion by 2015, according to IC Insights. That represents a predicted average growth rate of 15 percent for the next four years. Besides the microchips used in the computers and networks controlling the smart grid, semiconductor microchips will be the enabling technology in smart meters, as well as home-area and business energy-management networks. These microchips will include embedded processors, micro-controllers, wireless radio frequency (RF) chips, power transistors, flash memories, and communications chips. Already today, many semiconductor vendors are offering application-specific system-on-chip (SoC) solutions for smart meters that handle all communications with the grid, household appliances, smart wall plugs, intelligent thermostats, and energy-management systems. 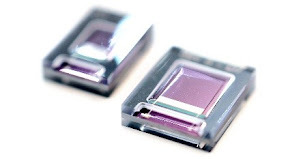 #CHIPS: "Researchers: Carbon better than copper for TSVs"
Three-dimensional chip stacks are better connected with through-silicon-vias (TSVs) filled with carbon nanotubes instead of copper, according to researchers at Chalmers University of Technology in Gothenburg, Sweden. Image credit: Teng Wang, Kjell Jeppson, Lilei Ye, Johan Liu. 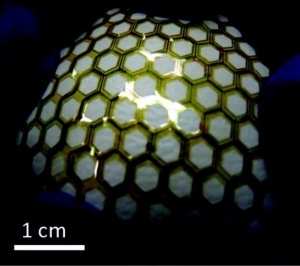 Carbon-Nanotube Through-Silicon Via Interconnects for Three-Dimensional Integration. Small, 2011, Volume 7, pages 2,313–2,317. Copyright Wiley-VCH Verlag GmbH & Co. KGaA. Reproduced with permission. TSVs promise to speed up the communications among all the chips that make up an electronic system by stacking them in 3-D instead of laying them out flat on circuit boards. Unfortunately, filling the vias with copper causes problems with thermal expansion, since copper expands more than the surrounding silicon. Carbon nanotubes could solve this problem. #MEMS: "Smart Arrows Report Flight Stats"
Using micro-electro-mechanical system (MEMS) accelerometers in arrows, smart archers now can precisely record the speed, distance and other flight statistics for their shots. Archery is the latest sport to aid athletes by equipping arrows to record an archer’s performance for later review. By mounting a micro-electro-mechanical system (MEMS) accelerometer inside the tip of an arrow, archers can now take advantage of the same motion processing algorithms that have already revolutionized other professional sports. Surfing and snowboard/skiing were recently revolutionized with micro-electro-mechanical system (MEMS) sensors that record performances. Now archery is joining the instrumented sports arena by virtue of a MEMS accelerometer from Analog Devices Inc. (ADI). 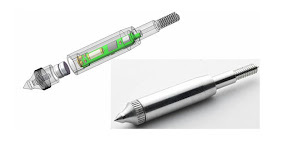 The MEMS accelerometer is small enough to be built into the tips of smart arrows. ADI already supplies much of the world's need for high-performance inertial MEMS chips--such as accelerometers and gyroscopes--with design wins in everything from high-precision military munitions to instrumenting a special suit to track the motions of Ironman actor Robert Downey. Accelerometers can track the location, speed and distance traveled by objects to which they are attached by measuring the inertial forces in all three spatial planes. The ADXL346 accelerometer used for smart arrows, for instance, is a three-axis device that measures motion in the X-, Y-, and Z-planes, then stores the values in an on-chip FIFO (first-in, first-out) memory. The smart arrows manufactured by ADI customer Full Flight Technology capture the ballistic motion of an arrow from the moment it is shot to its impact with the target. Called the Velocitip Ballistic System, it is the first use of ruggedized accelerometers which are attached directly to the business-end of a sports system. For instance, the surfboard and snowboard accelerometers track the relatively benign motions of the athlete, whereas the smart arrow experiences violent motions that would be impossible for athletes to survive. Arrows experience launch forces of 1,000-Gs at launch and over 4,000-Gs on impact, but tests show that smart arrows can nevertheless survive up to 100 shots while using power from a single coin-cell battery pack. The standard nine millimeter diameter smart arrow tip weighs less than 6.5 grams and provides 13-bit resolution measurements of the speed, distance and other flight statistics. After shooting, the archer unscrews the smart arrow tip and plugs it into a handheld docking station which reads out the performance data, transfers it to the archer’s PC, and resets the smart arrow. No other equipment is required, unlike existing arrow flight measuring systems that require external equipment to track arrows. #ALGORITHMS: "Video Analytics Boosts Business Intelligence"
The millions of video surveillance cameras worldwide have opened a nearly billion-dollar market opportunity for smart software that can detect motion, recognize people, identify objects and track vehicles. Analytics running on the video feeds from the millions of surveillance cameras worldwide are recognizing objects and their behaviors to provide situational awareness of remote locations. As these algorithms get smarter, a new market is forming that incorporates video analytics into business intelligence tools. This market has the potential to grow to nearly $1 billion by 2016, according to ABI Research. 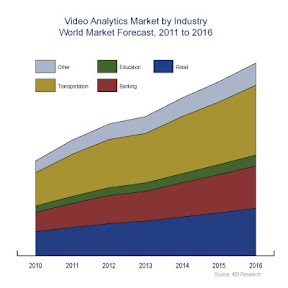 Business intelligence tools incorporating video analytics will become a $900 million market by 2016, according to ABI Research. Video analytics gets its smarts from emulating the functions of a biological visual cortex, allowing it to extract features from images with recognition algorithms. That information is then used to deduce the perceived behaviors in a manner similar to how a human would. Today security is still the seminal application, but business apps are growing fast in fields as diverse as entertainment, health care, retailing, automotive, transportation, home automation and safety. Most video analytics today run on servers, but accelerated PCs are also getting into the act, moving the analytic engines closer to the "edge" of the network where the video cameras themselves are located. Starting out with simple security algorithms, such as detecting motion inside a retail business at night when no one should be there, video analytics are getting smarter. For example, today they might be used by an operator to pinpoint objects that are moving, outline them with bright colored outlines and track them as they move. For retail, just counting the number of people frequenting different sections of a store can be useful, but more sophisticated algorithms are already available. For instance, digital signs are starting to use cameras to perceive their viewers, and then use analytics to change the displayed content to match the age and gender of the person currently looking at the sign. For sports, video analytics are being used to follow the ball, highlighting the player currently in possession as he or she moves around the field. And for mobile applications, smart video egomotion estimation techniques are able to identify the route being driven from vehicle-mounted cameras, creating a kind of visual odometer that does not require GPS. ABI Research recently surveyed smart video analytics in its report Intelligent Video Analytics, where it concludes that business intelligence usage of video analytics is shifting to PC-based edge-located devices, an effort being led by Intel's digital signage group. #WIRELESS: "Fire Burns Apple iPad Rivals"
The low price of the Kindle Fire is attracting new budget-conscious touch-screen tablet users. Amazon hopes those users plan to use it more as a wireless shopping device than as a laptop or netbook alternative. Amazon's Kindle appears to have hit a sweet spot in the consumer wallet with its full-color touch-screen tablet, according to IHS iSuppli. The group reports that Fire has already taken over the No. 2 slot, behind Apple's iPad, by selling below cost. By selling Fire at a loss, Amazon has attracted more consumers to the touch-screen tablet market, which IHS estimates will grow by almost 8 percent in the fourth quarter as a result of Amazon's ploy. Specifically, the market will grow to 64.7 million units for 2011 over its pre-Fire estimate of 60 million units forecast in August 2011. "Nearly two years after Apple Inc. rolled out the iPad, a competitor has finally developed an alternative which looks like it might have enough of Apple’s secret sauce to succeed," said Rhoda Alexander, senior manager, tablet and monitor research for IHS. "Kindle Fire, has found the right combination of savvy pricing, astute marketing, accessible content and an appropriate business model, positioning the Kindle Fire to appeal to a brand-new set of media tablet buyers." The big losers so far are the other touch-screen tablet makers that appear to be quickly losing market share to Fire, which also runs the Android operating system but which sells at less than half the price of its closest competitor, the Samsung Galaxy. IHS predicts that during the crucial Christmas season, Amazon will sell almost three times as many Android Fires (3.9 million) as opposed to either Samsung's Galaxy or Barnes & Noble's Nook (which will sell 1.37 million and 1.32 million, respectively). As a result, IHS forecasts a 13.8 percent market share for Fire in the fourth quarter, compared with 4.8 percent for Samsung's Galaxy and 4.7 percent for Barnes & Noble's Nook, with Apple's iPad at 65.5 percent. Amazon achieved a materials cost of $201, compared with Apple's iPad materials cost of $320, according to IHS, by dropping Bluetooth, adopting a slightly dimmer and smaller 7-inch touch-screen--compared to iPad's brighter, larger 12-inch touch-screen--and by limiting memory to a built-in 8GB with no expansion capabilities. As a result, Amazon's Kindle Fire trimmed almost $120 off its costs, allowing them to sell at a slim loss for $199, compared with Apple's markup of nearly 35 percent when selling iPads for $499. In the long run, Amazon's strategy calls for continually bundling services that encourage the use of Fire when purchasing other Amazon products. Currently, Fire comes with one free month of membership to the Amazon Prime buying service, free access to movies and TV shows, free use of the Kindle lending library, free two-day shipping on purchased items, and free Amazon Santa--an application that allows users to share their Christmas "wish lists" with their friends and family. Regardless of whether Amazon's business model works, IHS predicts that its aggressive entry will increase its projection for touch-screen tablet sales overall, which it has boosted to 287 million units in 2015 from its previous forecast of 275 million units. 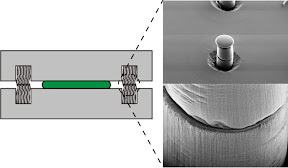 #MEMS: "Tiny chip enables battery-free sensors"
A MEMS chip can harvest energy from vibrations inside car tires allowing a tire pressure monitoring systems (TPMS) to run battery-free, according to Belgian research institute IMEC. The new MEMS energy harvester technology from IMEC, which can be used to power any low-current wireless sensor node, was reported Wednesday at the IEEE International Electron Devices Meeting in Washington. #MEMS: "Vibrating transistor integrated on CMOS"
A micro-electro-mechanical system (MEMS) transistor was announced by Semiconductor Research Corp. (SRC) and Cornell University, giving SRC members access to on-chip timing solutions for their CMOS chips. 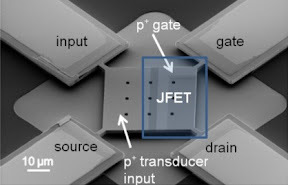 The MEMS-JFET builds a junction field-effect transistor (JFET) on top of a silicon resonator, providing both amplification and a rock-solid mechanical reference for on-chip channel-select filters and oscillators. #ALGORITHMS: "Profiting From IT as a Service"
By tracking computer usage and measuring it against return on investment, business analytics turns a data center into a profit--rather than a cost--center. Running IT as a service requires that every project have a business case with tangible benefits, clear return on investment and key performance indicators that measure how IT projects affect business goals, according to a Gartner report. That report, “The Future of the Infrastructure and Operations,” advises that infrastructure and operations become a "full partner with business." "IT as a service turns the data center into a revenue-generator instead of cost center," said Mike Kaul, CEO of Sentilla Corp., Redwood City, Calif. "But analytics are needed to maximize data center efficiency by measuring performance, utilization, capacity, energy usage and total cost of ownership." Sentilla's planning module runs analytics that compare costs between traditional IT, virtualization, and private- and public-cloud migration, allowing managers to "what-if" the ROI for running IT as a service. Of course, traditional business modeling techniques--spreadsheets chock full of ad hoc assumptions--can be used to perform the necessary analytics to maximize profit from IT as a service, but the Sentilla software suite instead makes actual measurements of performance, utilization, energy usage and key performance indicators, thereby allowing IT to benchmark efficiencies and calculate ROI for all its various projects and implementations. Sentilla began as a software suite that measured energy consumption of every device in the data center, but has evolved into a planning tool that can predict the potential savings from switching to different implementation technologies. 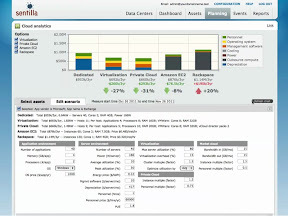 The latest incarnation adds tools to manage and maximize ROI for data center projects by minimizing capital investment and operating expenditures. IT management can now quickly gain actionable insights that increase performance, efficiency and capacity without the need to prepare traditional spreadsheets that make assumptions instead of measure performance. Using its ongoing measurements of performance, efficiency and capacity, Sentilla provides visibility into data center operations that allows projects to be planned with ROI predictions based on real measurements rather than unsubstantiated assumptions. The new version supports IT as a service with new planning modules that permit benchmarking costs for projects before committing to performing them in-house, using virtualization, or with private- or public-clouds. #ALGORITHMS: "Smarter App Prototyping Sans Programming"
Instead of requiring sophisticated programming skills just to design a mobile application, a smarter prototyping technology divorces design from coding, allowing business analysts to create demonstration apps before IT programs them. Enterprise visualization software is no longer just for displaying the results of complex analytics, but can now be employed to accurately render the user experience for applications that have yet to be written. Giant corporations have been using sophisticated application development tools for the Web that allow rapid prototyping of simulated user experiences before IT codes the application. Now those high-end tools are coming down to the mobile application arena, allowing any business analyst to prototype mobile applications in hours instead of months. Once the prototyped simulations are validated by users and approved by management, they can be handed off to IT for coding. "We are transforming how business analysts communicate with IT," said Emmet Keeffe III, CEO and co-founder of iRise. "Instead of IT coding an app only to find that it does not meet user's expectations, our rapid-prototyping and visualization software allows analysts to present a working app to users before IT even starts coding it." The consumerization of IT has put tremendous pressure on enterprises to create mobile applications fast, and such rapid-prototyping and visualization software can cut up to 50 percent off application development time, according to Keeffe, who claims iRise customers report this productivity gain. Today, iRise's customer list includes General Motors, UPS, FedEx and J.P. Morgan. By adding mobile application development with its latest release of iRise, the company hopes to further diversify its customer portfolio. The latest release of iRise now includes support for mobile application development on either PCs or Macs, plus it includes special features that allow direct access to the hardware of the most popular smartphone and tablet platforms such as the iPhone and iPad. Using tools akin to a word processor, spreadsheet, and presentation program, business analysts can craft mobile applications that look-and-feel just like those already popular on mobile platforms. "We mimic the easy parts of Microsoft Word, Excel and Powerpoint, so that apps can be quickly prototyped using familiar tools," said Keeffe. "The iRise program is like a CAD [computer-aided design] environment that comes with all the elements you need to specify apps without coding them, including scrolling, using sliders, flipping through pages, stretching or compressing displays and so forth." The iRise program renders an entire functioning iPhone on a PC or Mac screen while developing simulated applications. Users can also download the free iRise Mobile application from the Apple Store to try out a newly created application simulation. After users beta-test the simulated application and the business analyst incorporates their suggestions, the entire prototype can be shipped to IT for coding. The newest iRise release includes an iPhone Content Module that contains the Apple's user interface (UI) elements, from the barrel spinner to the sliding on/off switch, all of which meet Apple’s iOS UI Element Usage Guidelines. #ROBOTS: "Pocket-Bots Swarm Over Social Apps"
Tiny coin-sized robots work together in swarms to test out socially oriented applications that employ cooperative behaviors that today require humans to perform. Teams of humans--from soldiers to athletes--routinely work together to accomplish socially oriented tasks such as search-and-rescue missions. Robots, on the other hand, have so far been best deployed alone or under remote control. Now, however, Harvard University claims to have created an autonomous robot small and cheap enough to try out algorithms that coordinate team-like behaviors among legions of autonomous robots. Today, there is no shortage of algorithms designed to emulate the team-oriented behaviors of cooperating humans, but their execution can only be done in software simulations or, at best, among a small group of robots. Harvard University, on the other hand, envisions legions of coin-sized robots executing the test algorithms designed to demonstrate cooperative behaviors among automatons. Created by members of the Self-Organizing Systems Research Group, led by Harvard professor Radhika Nagpal, the Kilobot reduces the size and cost of robots to the point of enabling large-scale hardware emulations of cooperative behaviors rather than just software simulations. Harvard has licensed its cost-reduced Kilobot design to the Swiss robot manufacturer K-Team Corp. (Yverdon-les-Bains, Switzerland), which markets the robots and their development system. According to Nagpal, the Kilobot has been cost-reduced using a variety of novel techniques that together make hardware emulation of cooperative behaviors feasible for the first time. For instance, instead of costly conventional motors for wheeled locomotion, the Kilobot uses inexpensive vibrational motors attached to its spindly legs. Turning on one motor causes off-center centripetal forces that rotate the robot, whereas turning on two adjacent motors simultaneously causes forward motion at a fraction of the price of conventional motors. The Harvard researchers--comprised of Nagpal and Michael Rubenstein, a postdoctoral fellow, along with Christian Ahler, a Harvard fellow at its School of Engineering and Applied Sciences and the Wyss Institute--recently demonstrated 25 Kilobots working together to emulate a variety of cooperative behaviors, including lining up in formations like soldiers, foraging like animals and synchronizing fully autonomous behaviors like a team. 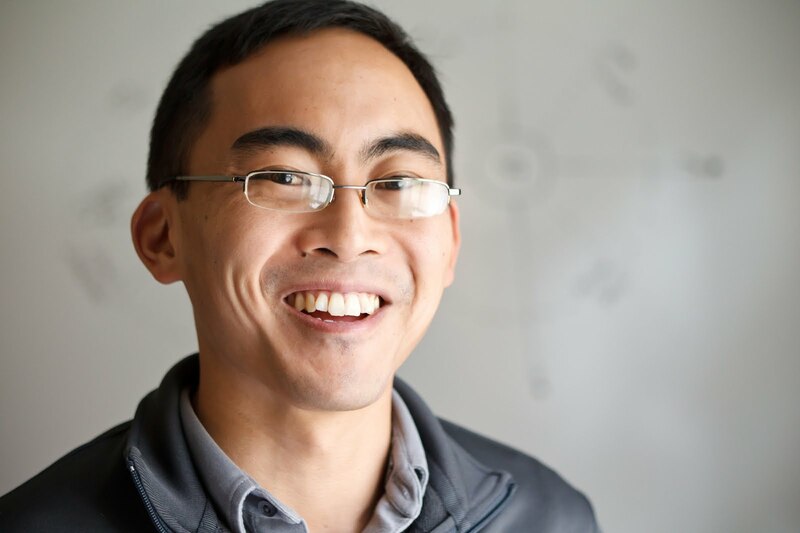 Once an algorithm is perfected with just a few robots, the Kilobot architecture allows it to be expanded to include potentially thousands of autonomous robots working together. The researchers expect Kilobot algorithms to be perfected for research into the swarming behaviors of real insects, such as to collectively moving large objects or building nests, as well as human-oriented cooperative behaviors, such as searching through rubble for survivors after an earthquake. The Kilobot could also test out algorithms that use thousands of robots to remove pollutants from hard-to-reach areas. Funding was provided by the National Science Foundation and the Wyss Institute.